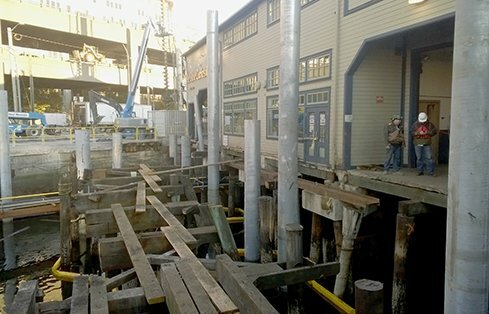 The seismic design recommendations for Ivar’s Pier 54 improvements included the addition of steel pipe piles to reinforce the 100-year-old wooden structure. By taking a performance-based engineering approach on the Pier 54 project, the GeoEngineers team was able to model the interaction between both wood and steel piles with the potentially liquefiable soil in which they would be anchored. In addition to seismic design recommendations, GeoEngineers provided construction observation services while the new piles were installed. Pier 54 is a turn-of-the-century pier in Seattle, Washington, along the Puget Sound waterfront, home to Ivar’s, a waterfront seafood restaurant. A performance-based engineering approach to model earthquake risk for a historic Seattle Pier. Pier 54 is a turn-of-the-century pier in Seattle, Washington, along the Puget Sound waterfront, home to Ivar’s, a waterfront seafood restaurant. 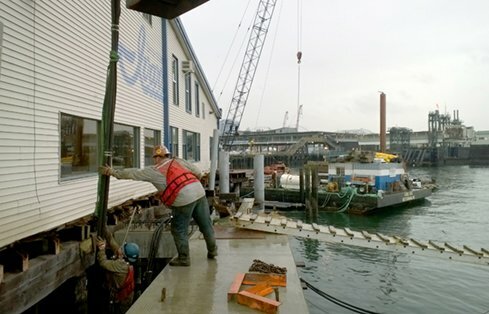 Concerns about the stability of the 100-year-old wooden pier, especially in the event of an earthquake, motivated Ivar’s to begin a series of significant seismic upgrades to the structure. As a member of the Reid Middleton team, GeoEngineers performed a seismic hazard analysis as a first step toward developing geotechnical recommendations for the pier. GeoEngineers’ seismic specialists used a FLAC 2D model to analyze the site-specific responses of the soil used to anchor pier-supporting piles. Under earthquake conditions the soil posed a liquefaction risk, meaning it could lose stability, act as a liquid, and impose additional force the foundations would need to resist. A traditional factor of safety modeling approach wasn’t possible for the pier, because it would have had to reconcile existing wooden piles with the new steel piles being used for reinforcement, two structures with very different stiffness and loading characteristics. Instead, the team used a performance-based engineering strategy for the model, which allowed them to consistently analyze how the two types of piles would interact. GeoEngineers then introduced various types of earthquakes into the model to simulate the soil/pile interaction in each case. The team also understood that a new seawall, built just feet away from Ivar’s, would affect how the pier would behave in earthquake conditions. By taking a broader look and including both structures as a single system in their analysis, they were able to reliably design the seismic upgrade to meet the desired performance objectives under earthquake conditions. Reid Middleton based their renovation designs on GeoEngineers’ modeling data and recommendations. 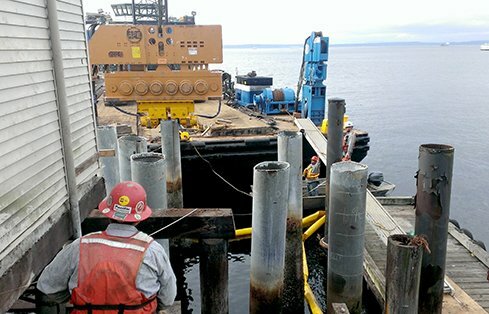 The team replaced existing timber aprons with new steel pilings, precast concrete caps and deck panels. Ultimately GeoEngineers’ model demonstrated that the total number of necessary support piles could be safely reduced, decreasing overall construction cost. Because a standard modeling approach wouldn’t have been able to reconcile the different safety factors of wood and steel piles, the team used a performance-based engineering approach. By including the complete pier system in a FLAC 2D model GeoEngineers was able to predict soil/pile interaction and how the piles would deform during three different types of earthquakes (crustal, subduction zone intraplate, and subduction zone interplate). In each earthquake scenario, the GeoEngineers team carefully modeled the dynamic response of piles in the potentially liquefiable soils, and found that fewer piles could provide the same level of safety while lowering construction costs. The team also broadened their analysis to include the nearby seawall. The pier and seawall, two very different structures, would behave differently in earthquake conditions, and affect each other. By including the seawall in the model GeoEngineers improved the accuracy of the seismic design recommendations and improved the safety of the final pier structure. The Reid Middleton team used recommendations based on GeoEngineers’ models to determine design parameters for the renovated pier. GeoEngineers also provided construction observation during the installation of new piling, foundations, and a new concrete apron. 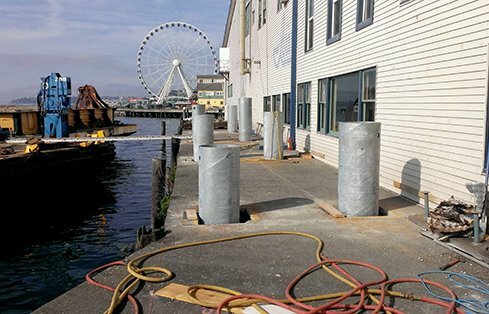 By using advanced performance-based engineering modeling techniques, GeoEngineers showed the Pier 54 renovation could be safely completed with fewer piles than originally planned. Carefully examining the interaction between the two different types of piles and potentially liquefiable soils in a variety of specific earthquake scenarios led to geotechnical design recommendations that saved construction costs while maintaining a high standard of safety.